Allows user to move freely, while giving security to less seasoned users. Includes locking mechanism to insure safety. Solid feel gives customers confidence to walk or run. feeling while walking or running. Allows user to define and adjust incline. Simple and fast. 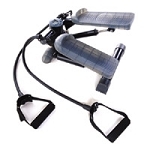 Makes adjustment easy for walking or running. Includes speed, distance, time, calories and scan feature. Large LCD window for easy reading. Fits nicely into modern decor. Treadmills Weight Limit is 300 Lbs. Dimensions: 50" x 18" x 8"